A beautiful stretch of pristine white sands on the uninhabited Whitsunday Island is the Whitehaven Beach. It is one of the cleanest beaches in Australia. The fine sand on the beach is unique to the area and is known for not retaining heat, making the beach cool and comfortable to walk barefoot. At the northern end of Whitehaven Beach is this picturesque inlet that offers stunning views of the ocean and beach. A short boat ride from Airlie Beach gets you to Tongue Bay and a short walk up the hill thereafter takes you to Tongue Point, which offers the best views. The beach and island are protected and situated in the Whitsunday Island National Park. 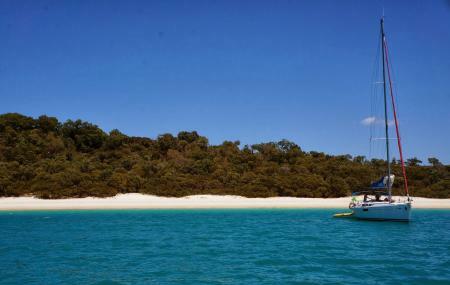 Several cruises and tours operate from Airlie Beach to the Whitsunday Island making the beach easily accessible. Dogs are not permitted on the beach and cigarette smoking is prohibited. The sand is very fine, and can damage electronic equipment such as mobile phones and cameras. How popular is Whitehaven Beach And Hill Inlet? People normally club together Hamilton Island Go Kart Track and Paddy's Shenanigans Irish Bar And Restaurant while planning their visit to Whitehaven Beach And Hill Inlet. People also prefer to end their day with Whitehaven Beach And Hill Inlet.